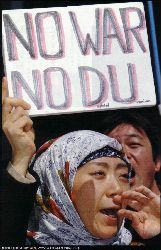 No War! No DU ! This is a greeting in Arabic, which means "Peace on you." We, muslims, bless each other with this words. Assalam Alaykum. Peace on you. Mr. Bush, who call yourself as a pious Christian, and all Christians who support this war, please read your Bible once more. Do you find any words in the book to justify you to kill people? Do you find any words in it to justify invading other nations? Your war, which you name justice, takes away the dignity, trust and love from people. Although you say you are fighting against terrorists, as a matter of fact, you force peaceful people to become terrorists. From now on, you have to live scared in serious doubt against human beings. You have taken a choice of a hell in this world. I believe that Jesus Christ was crucified by the people like you, hypocrites, whom you call Christians.